August 30, 2018, Adrian, Michigan – Many of us have spent our lives listening to or reading the parables of Jesus, but what if we took another look at them? 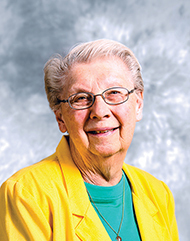 Sister Anneliese Sinnott, OP, recently retired Professor of Systematic Theology at Ecumenical Theological Seminary in Detroit, offers a series of presentations, “Parables Revisited.” The sessions take place from 1:30 p.m. to 3:00 p.m. Wednesdays, September 19, October 17, and November 14 at Weber Retreat & Conference Center. Remember to bring your Bible as Sister Anneliese unpacks these wonderful stories from the Gospels. Registration is required, and a goodwill offering will be accepted. To register, visit www.webercenter.org and click on “programs.” Registrations may also be made by contacting Weber Center at 517-266-4000 or webercenter@adriandominicans.org.